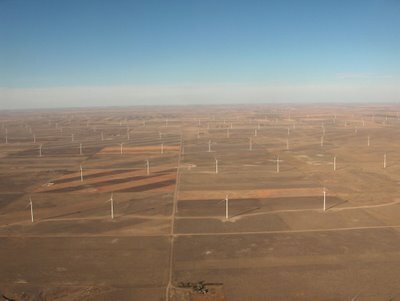 I was out last week flying in the LongEZ and I decided to check the progress of the large wind farms that are under construction in Northern Colorado. One of these wind farms called Cedar Creek is right at the Wyoming-Nebraska-Colorado border and the other is farther east in Colorado, just south of Sidney, Nebraska. It is called the Peetz Table Wind farm. Between them, they have 500 wind turbines with a peak generating capacity of 700MW. One of the things that impresses me most about wind farms is how fast they get built. These two facilities were just in the discussion stages 2 years ago. Early this spring they were just setting up the towers and now all towers are nearly complete and generating power. When I was growing up in Pennsylvania, nuclear power projects like the Susquehanna Steam Electric Station took a very long time to build, with an average build time of 12 years. By contrast these wind projects are going up in a year or less, and the amount of land available on which to build them is substantial so I would expect to see many more going up over the next few decades. Out west we also don’t have nearly the number of people objecting to them with NIBMY excuses. I suppose when your closest neighbors include 220 Minuteman silos, you have a different perspective on what constitutes a “good neighbor.” Some people can be very picky about what they allow in their backyards, as evidenced by Cape Wind. 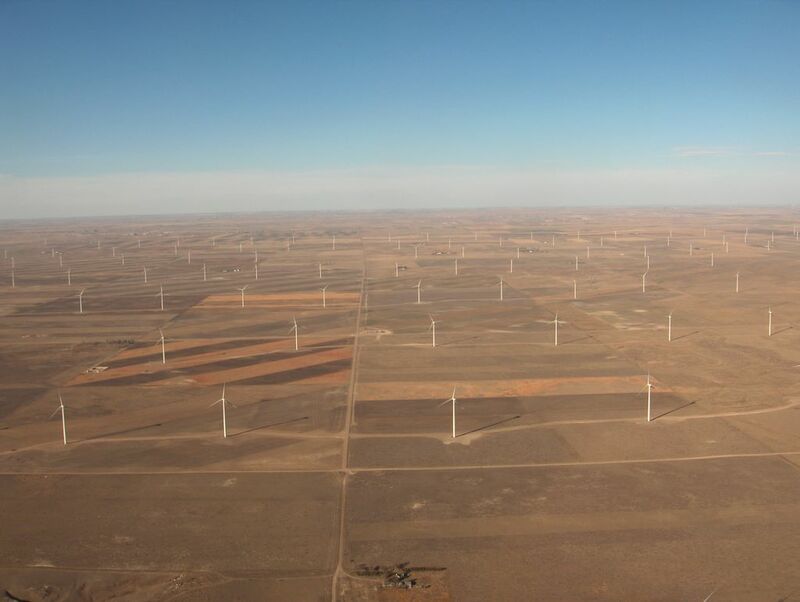 My previous blog posting on Colorado wind power included an aerial shot of Colorado’s Ponnequin wind farm near Cheyenne, and I now have some new photos of the new wind farms I mentioned, each which has more than 200 wind turbines. There are also some photos of the new Vestas Blades factory which is under construction in Windsor. It will produce about 1200 40-meter wind turbine blades per year when it is completed next spring. They are even talking about expanding it to increase the rate of production by 50% within a year of commencing operation. This entry was posted in aviation, energy, wind by Lee Devlin. Bookmark the permalink. It’s quite an honor to find the author of Cape Wind in my blog comments. I listened to your interview with Dennis Miller and it was excellent, especially where he introduced you with a credit as the lead singer of the Plasmatics :-). It was humorous and very informative.